Efforts by Myanmar’s military government to incorporate that country’s numerous armed ethnic groups into a single border guard force will probably lead to further conflict and spawn an influx of refugees into neighbouring countries, analysts and aid workers warn. Myanmar, with an estimated population of 57.6 million, is one of the most ethnically diverse countries in Southeast Asia. Under Myanmar’s military-drafted 2008 Constitution, all armed forces in the country must be placed under central military command - an ambitious undertaking in a country which has over a dozen armed ethnic groups (all but a handful of which have ceasefire agreements with the military government). To achieve this, the regime has demanded that all of the ceasefire groups be incorporated into a Border Guard Force (BGF), which would entail disarming them, re-supplying them with government-issued weapons and making their troops subordinate to regional Myanmar military commanders. To date, however, only two groups have agreed: the Democratic Karen Buddhist Army (DKBA) and the National Democratic Army-Kachin. In August 2009, the refusal to join the BGF by one of the smallest ethnic factions in the country - the Myanmar National Democratic Alliance Army operating in the Kokang region of northern Shan State - resulted in a military offensive launched by government troops which led to more than 30,000 refugees fleeing over the border to China. “The BGF is an indirect order [by the regime] for the ethnic groups to surrender their weapons,” said Zin Linn, a Burma analyst who lives in exile in Thailand. “But without guns, the groups cannot defend their rights and their people so they will hold on to their guns until they gain autonomy and self-determination,” he said, adding that armed conflict will almost certainly break out and that refugees fleeing Burma will be “unavoidable”. 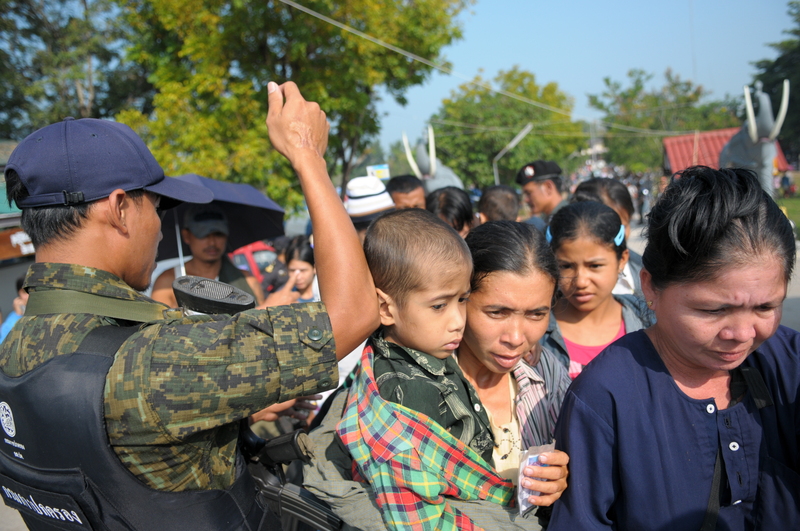 Refugees walk by a Thai security official at a temporary shelter in Mae Sot before returning to Myanmar in November 2010. Thousands fled fighting in the aftermath of the country's general election on 7 November 2010. Earlier this month, fighting broke out between government forces and a breakaway faction of the DKBA which opposes the group’s decision to join the BGF. On 7 November, the day of Myanmar’s general elections, DKBA troops of Brigade 5 stormed the town of Myawaddy on the Burmese-Thai border and took over several key positions. Fighting for control of the town the next day led to some 20,000 people fleeing into Thailand, while clashes further south resulted in some 5,000 more refugees. Although most of these refugees were repatriated to Myanmar within days, some 2,000 remain in hiding on the Myanmar side of the frontier, according to K’Nyaw Paw. “It is very difficult to access and get supplies to these people,” she said. Renewed fighting on 27-28 November between DBKA Brigade 5 troops and government forces has sent some 1,200 more refugees into Thailand, according to reports. Meanwhile, other groups such as the Kachin Independence Army and the United Wa State Army are preparing for possible military retaliation by the government for refusing to join the BGF, say analysts.